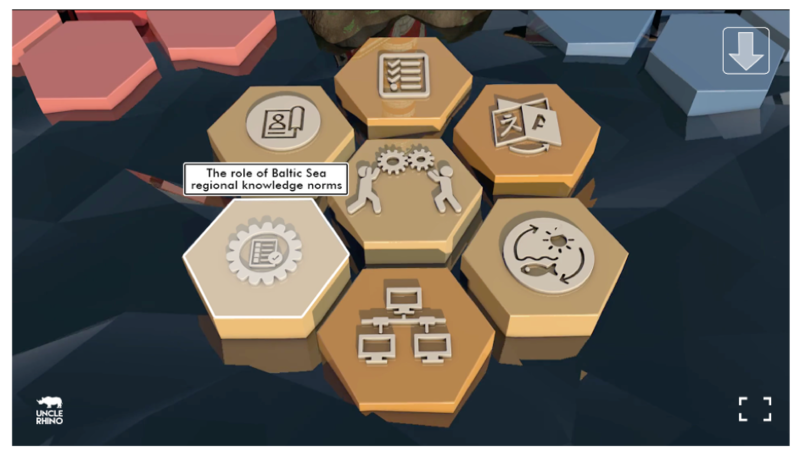 To provide an overview of possible integration challenges (stakeholder, knowledge, sector and multi-scale), which might arise in MSP, the BONUS BALTSPACE project developed a communication tool. The tool only concerns the study on the integration challenges and not the other project findings on tools and recommendations. The communication tool consists of 5 small movies (all 1 minute each) and 4 exploration areas. The tool is interactive and provides users the opportunity to explore in depth the findings they are most interested in. How to present MSP research findings in an interactive video format? What are the main integration challenges for Maritime Spatial Planning and what are possible solutions or enablers for these challenges? The BONUS BALTSPACE project analysed four important integration challenges for Maritime Spatial Planning in the Baltic Sea. To increase the outreach and dissemination of the project’s outcome a communication strategy has been developed. This strategy, besides infographics and stakeholder meetings, includes the development of an interactive communication tool. This practice describes the development of the tool and the final result. Disseminate the BONUS BALTSPACE project findings on MSP Integration Challenges, by developing an easy to use tool, targeting scientists, practitioners as well as stakeholders of different sectors. A professional designer develops storyboards, which have been discussed, commented and improved. An interactive session of several hours was organised together with the researchers discussing how to change research findings into visuals and how to get the maximum added value out of animated movies. A professional designer makes the movies and integrates them on the website. Dissemination of the communication tool through existing networks. The tool consists of 1 introduction movie explaining MSP, followed by the possibility to click on one of the 4 other movies. These movies automatically end in an area of most important findings on the individual challenge. Users are able to click on the icons, which make a text box with project findings pop up. The communication tool is interactive and allows users to self-explore the 4 integration challenges as well as the main findings by clicking with their mouse on the topics, they would like to know more about. Besides the interactive tool, one large movie has been produced, which combines all 5 movies in a row. This movie was uploaded on Vimeo and Youtube. The communication tool is specifically made for the BONUS BALTSPACE project and therefore is focussing on the Baltic Sea. However, the other sea basins have similar integration challenges, therefore the tool is also interesting to be used by other projects or initiatives. The language of the movies is English and can those be watched and understood by many interested users from all over the world.